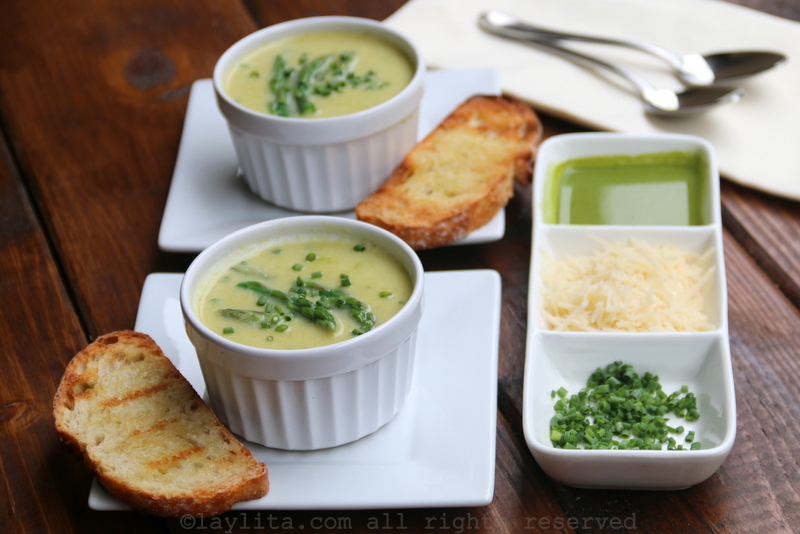 This easy and delicious homemade cream of asparagus soup recipe is made with fresh asparagus cooked with butter or olive oil, garlic, onion, white wine, broth, potato, cream, and lemon juice. 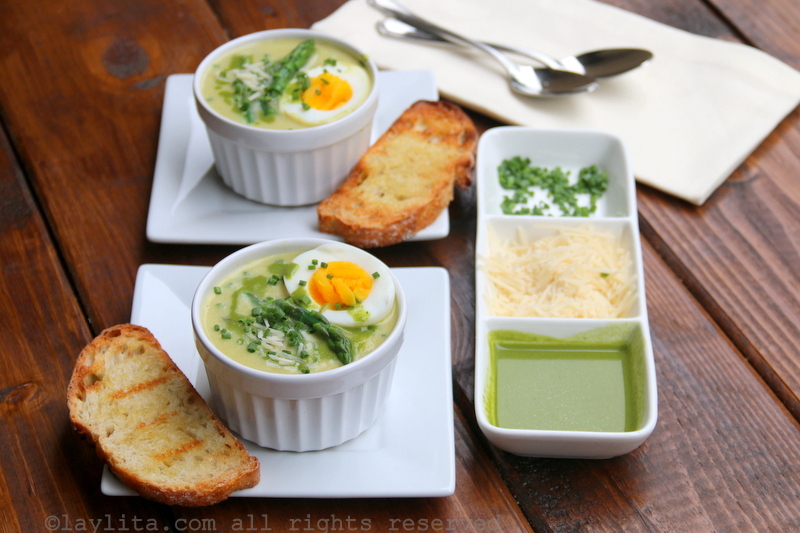 Most of the ingredients in this asparagus soup can be adjusted or changed according to your personal preference, or to the ingredients you have available. The only exception is the asparagus – obviously. For example, I added a potato to give it a thicker consistency, but feel free to omit it if you don’t mind a more liquid style soup. I used heavy cream, but other potential alternatives include half & half, regular milk, plain yogurt, etc. If you don’t want to use white wine, you can replace it with additional broth. Soups are very popular in Ecuador and are usually served as the first course with the “almuerzo” or lunch meal. Creamed soups were my least favorite as a child. This mainly because unlike many of the traditional Ecuadorian soups that are made from scratch, the cream soups or “cremas” were made using dry mixes. And it didn’t matter the flavor listed on the packet, they all had the same horrible after taste. It took several years before I discovered that a vegetable cream soup using fresh ingredients, and made from scratch, could be delicious. There’s no comparison to the fake artificial flavored ones. One of my favorite parts of serving and eating a cream soup – or any soup – is adding garnishes that give it some extra texture or a contrasting touch of flavor. I’m especially fond of having a few different options of soup toppings or garnishes that people can mix and match to their preference. If you’ve tried some of my other soup recipes, particularly the Ecuadorian ones, then you know that I tend to serve almost every soup with avocado. So, you might be surprised (for the good or the bad) that I didn’t use avocado as a garnish for this cream of asparagus soup. I used the asparagus tips, the best part, just quickly boiled, as the main garnish for the soup. I also included chopped chives, grated parmesan cheese, and grilled garlic bread. I also drizzled a parsley lemon sauce on top – but olive oil is also another great option. 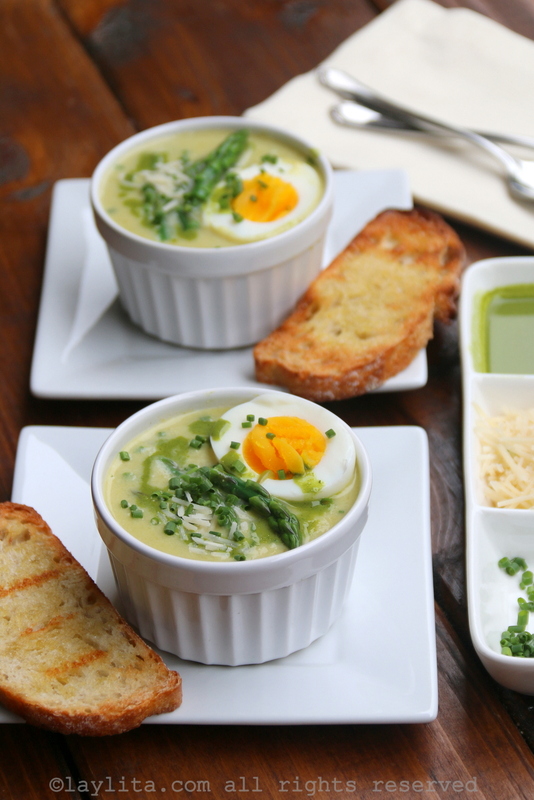 I love the combination of asparagus and eggs, so I also added a soft-boiled egg as a garnish option. Other ideas of garnishes that would work well with this creamy soup include smoked salmon, or crispy pancetta/bacon, some crème fraiche or a yogurt sauce, your choice of fresh herbs, etc. 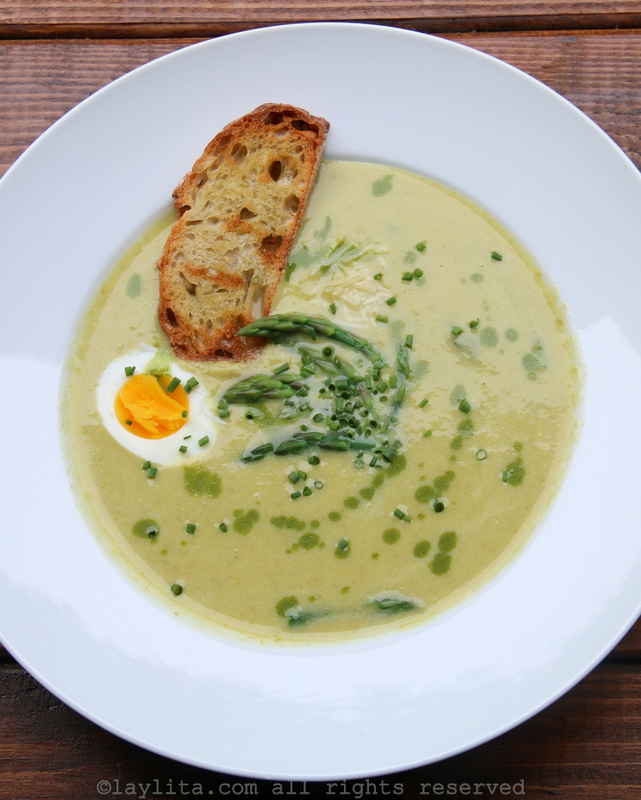 This easy and delicious homemade cream of asparagus soup recipe is made with fresh asparagus, garlic, onion, broth, white wine, cream, potato, and lemon. 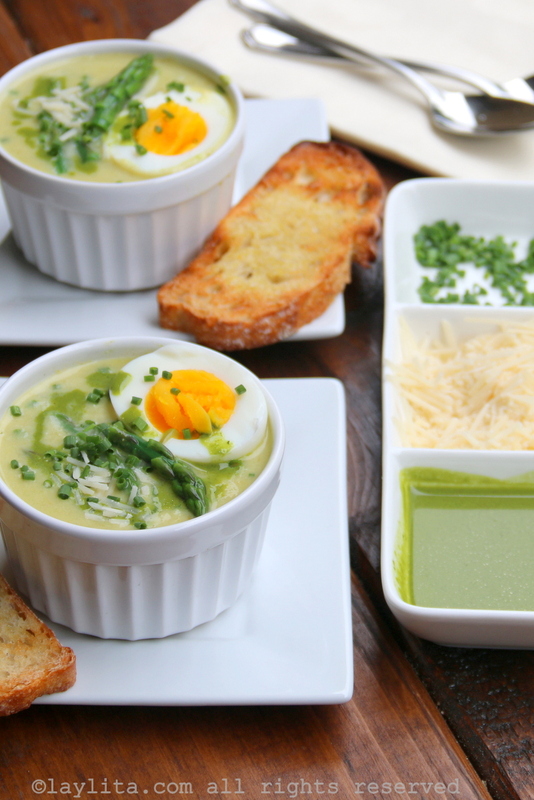 It’s served with chives, grilled garlic bread, soft boiled eggs, and more. Sauté the diced onions and crushed garlic in butter or olive oil for about 5 minutes. Add the asparagus pieces (save the asparagus tips for later), cook for another 2 minutes. Add the wine, cook until reduced by half, on medium high heat for about 5 to 7 minutes. Add the broth and the potato chunks. Bring to boil, reduce the heat - cover partially - and cook until the asparagus and potato are tender (about 15-20 minutes). 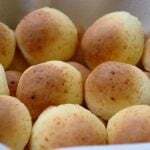 Remove from the heat and let it cool down. Meanwhile in a small saucepan bring 1 cup of lightly salted water to a boil and add the asparagus tips. Boil for a few minutes until tender (but still green). Remove from the heat, strain the liquid (save it) and place the asparagus tips in cold water. Working in batches, blend the cooled down soup until you have a smooth puree. If you want it extra smooth, you can strain it using a fine mesh strainer. If the puree is too thick you can add some of the water used to boil the asparagus to get it to the right consistency. Return the asparagus puree mix to the soup pot and re-heat it over low heat. Stir in the cream (or other alternative) and the lemon juice. Mix well, taste and adjust salt if needed. 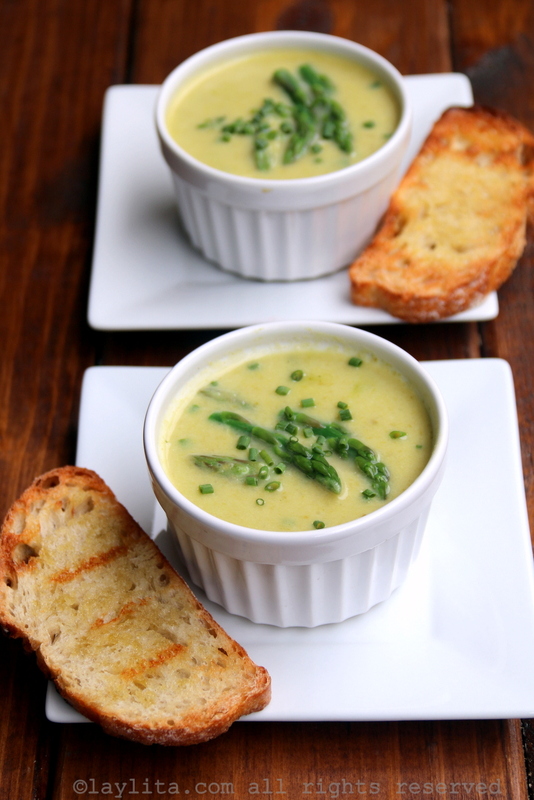 You can mix in the boiled asparagus tips directly to the soup pot or add them individually to each soup cup or bowl. Serve the cream of asparagus with your choice of garnishes or sides. 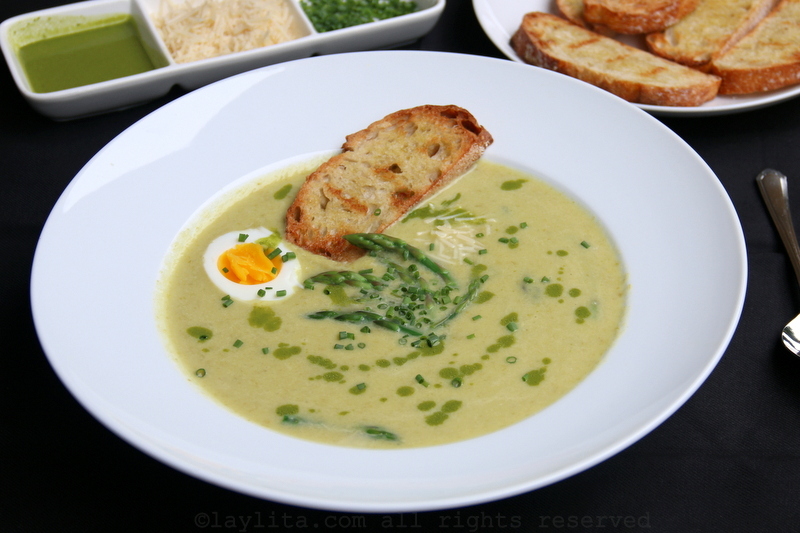 I served it with chopped chives, parmesan cheese, parsley lemon sauce, soft boiled eggs, and grilled garlic bread. 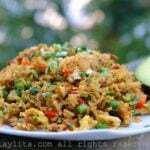 Looks delicious, I can’t wait to make it!